Paris Voyage is a business formed by a French-American to help English-speaking tourists find their way around the city of Paris. It sells advertising in its various online and printed guidebooks. 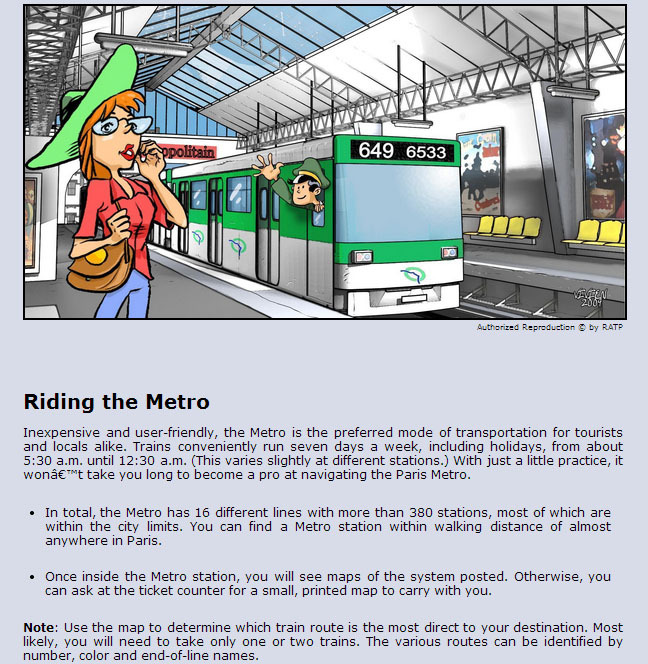 When the French government contracted Paris Voyage to build a website that explained how to use the Paris subway and bus system, the company needed assistance in writing the content. Susan Greene, freelance writer, was hired to write an online transit guide to accompany the cartoon-like illustrations on the website. The copy, which included about 50 web pages, had to be easy to understand by tourists from all over the world. All instructions had to be super simple and coordinate with their corresponding illustration. The website receives thousands of visitors each day. The Paris government was pleased with the final product and credits it with helping millions of tourists navigate their city’s public transportation system. Does your company need an informative website to promote its products or services?